After the deluge of gifts many people have exchanged at Christmas, January seems a good time for soul-searching over the Western obsession with stuff, writes trend forecaster James Wallman. We have more stuff than we could ever need - kit we don't use, toys we don't play with, and clothes we don't wear. Consider the average British woman. According to various surveys, she buys 59 items of clothing each year, she has twice as many things in her wardrobe today as she did in 1980, and she has 22 things in there she has never worn. I'm not piling all the blame on to the average British woman though. We're all guilty. So many of us have so much stuff today, in fact, that a team of anthropologists at the University of California, Los Angeles (UCLA) have decided, after one of the most extensive pieces of research into contemporary life ever conducted, that we are living in "the most materially rich society in global history, with light-years more possessions per average family than any preceding society". In the smallest home in their study, a house of 980 sq ft, there were, in the two bedrooms and living room alone, 2,260 items. And, because of the rules the anthropologists were using to count, that was only the things they could see when they stood still. They didn't count any of the stuff that was tucked into drawers or squeezed into cupboards. The other homes were just as packed. On average, each family had 39 pairs of shoes, 90 DVDs or videos, 139 toys, 212 CDs and 438 books and magazines. Nine out of 10 had so many things that they kept household stuff in the garage. Three quarters of them had so much stuff in there, there was no room left for cars. All the case studies were in the US. But is it really that much different in the UK or any other Western country? Do you have lots of stuff? Do you have more than you need or use? Do the kids have too many toys? How many pairs of shoes, DVDs, and books and magazines do you have? Is there room for cars in the garage? As you can see, this is clearly not only an American problem, or a British problem. We're all to blame, and we're all suffering. At the end of their study, the anthropologists concluded that because of the sheer numbers of artefacts people today own, we are at a point of "material saturation". 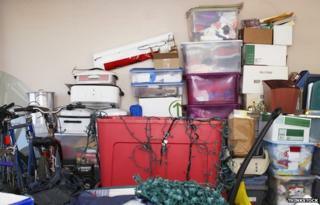 We are coping with "extraordinary clutter" - facing a "clutter crisis". The simplest way to explain not only why we are drowning in stuff, but also why this is happening now, is through a relatively new branch of the social sciences called evolutionary psychology. This discipline tries to explain why we do what we do - based on how we've adapted and evolved over billions of years. It makes sense, for instance, of why we like sweet, fatty foods like cake, and why we eat as much as we do. Food scientist Brian Wansink, author of Mindless Eating, wrote: "We have millions of years of evolution and instinct telling us to eat as often as we can and as much as we can." This instinct to eat as much as possible whenever possible made sense when food was scarce. But it made a lot less sense when, in the 20th Century, synthetic fertilisers and higher-yielding seeds and combine harvesters produced not only enough, but much more than enough. Now, although the automatic impulse to eat as much as possible was no longer relevant, we weren't able to simply switch it off like a light switch. Hardwired to eat, many of us became fat. Now we talk of an obesity epidemic. Just as evolutionary psychology explains why we eat far more than we need, it also throws light on why we keep buying more, even when we already have far more than enough. We are now living in an age of abundance in the West. Before, material goods were expensive and scarce. Clothes were so hard to come by that they were handed down from generation to generation. A historian called Eve Fisher has calculated that before 1750 and the onset of the industrial revolution a shirt would have cost around £2,000 in today's money. But now, things - shirts, shoes, toys and a million other consumer items - are cheap. Once again, our inbuilt impulses have yet to catch up. As a result, many millions of us are filling our homes and lives, and suffocating under too much stuff. This problem, which I call "stuffocation", is the material version of the obesity epidemic. Since obesity is one of the most worrying problems we face, as individuals and as a society, saying that stuffocation is similar is quite a statement. But the comparison works, because both obesity and stuffocation have similar numbers of sufferers. About two-thirds of people are overweight, according to the UK government. But it's also been estimated about two in every three wish they had less stuff. Both obesity and stuffocation are bad for your health. Just as eating too much and being overweight is lousy for your physical health, so having too much stuff and feeling "stuffocated" is damaging for your mental health. Image caption "But it was a bargain..."
Two psychologists who worked alongside the anthropologists at UCLA recorded how people feel about their homes and tested them for the stress hormone cortisol. They found that women who have issues with clutter have the signature pattern of cortisol that is associated with people who have chronic fatigue, post-traumatic stress disorder, and a higher risk of mortality. So what will save us from drowning in a suffocating sea of stuff? Lots of people have come up with solutions in recent years. There are the anti-capitalist and anti-consumerist movements, for instance. But none of them strike me as realistic alternatives. They all seem too simplistic to me. If we rush into some sort of smash-the-system solution, we might end up throwing out the proverbial baby with the bathwater. Don't we want to keep all the good stuff that our system has brought us, like central heating, indoor plumbing, the internet, and smartphones? If so, we need a solution that won't bring the walls of our society tumbling down. There might be an answer. This idea is inspired by some research that proves happiness is more likely to come from experiences rather than stuff. It's also inspired by Jamie Oliver's Food Revolution, a campaign aimed at changing school meals. But instead of helping people be healthier by nudging them to eat healthy instead of unhealthy food, as the Food Revolution does, this is an "experience revolution" that will help people be happier by nudging them to spend their time and money on experiences rather than stuff. If more people do this, and join this "experience revolution", they will be happier - and they are far less likely to be drowning in stuff.